I do not normally take up a whole blog post on book reviews, and so when I do so it is because I think that the books being reviewed are worth the effort and time. That is the case with the seven books I’m about to briefly review in this blog post. 9Marks has produced books that are roughly 100 to 150 pages long on subjects that are vital for the health of our churches in any cultural context. If you are a fast reader, you can read each one of them in one sitting. It is worth the effort. In this blog post I summarise the contents of each one of these books in about 100 words. I hope that this will whet your appetite for more. 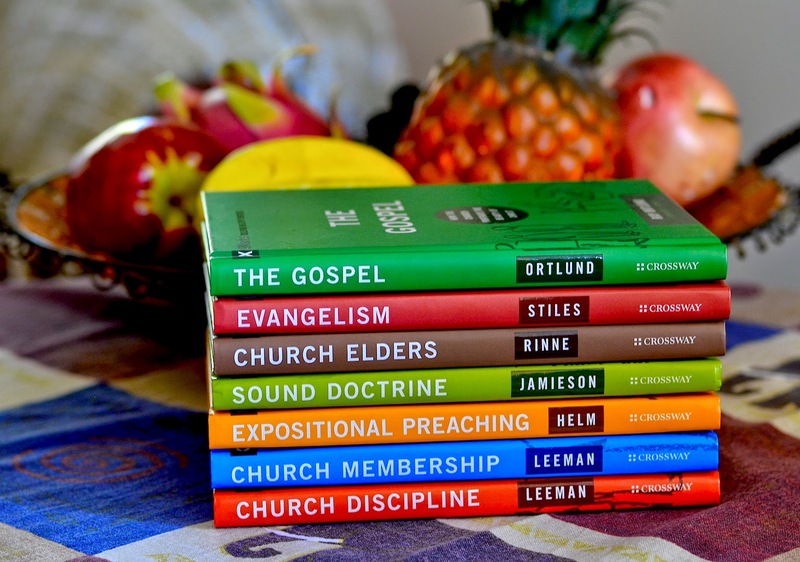 If you are already well-equipped with your own library, I would urge you to consider sponsoring a set of these books for pastors (especially here in Africa) who cannot afford them. Here in Africa, our greatest need is not about how to catch the rarest deep-water creatures on the ocean beds but simply how to swim. Hence most “how to” books coming off the Western press are too complex for us. These seven books are not! The author says, “This is a book about the gospel, yes. But more specifically, it’s about how the gospel can shape the life and culture of our churches so that they portray Christ as he really is, according to his gospel.” Ray expounds John 3:16 showing God’s love in redemption. He proceeds to apply this to the church and to all creation. The rest of the book deals with the deeper implications of “a gospel culture”, which is produced by a church permeated with gospel doctrine. I can only say that I wish every church pastor would strive to achieve this today. This is a book about developing a culture of evangelism in the whole church. Mack wishes to see less evangelistic programmes but more individual involvement in evangelism by church members. This involves intentional evangelism, life-styles shaped by the gospel, personal evangelism as a spiritual discipline, etc. To get us thinking, Mack begins with what most of us consider evangelism, i.e. the altar call system. Showing how it falls short of biblical evangelism, he proceeds to give us a positive dose of biblical teaching. This is a book about “lay elders”, i.e. those who are elders in the church but do not serve as paid pastors. It answers the question, “Now that I am an elder, what next?” The author writes, “This books is intended to provide a concise, biblical job description for elders. I want to create an easy-to-read, inspiring summary of the elder task that could be given to a new or potential elder who needs to know what an elder is and does.” Like any good book on eldership, Jeramie begins with eldership qualifications and then goes on to look at the work that elders must do. Each chapter in this book begins with the words, “Sound doctrine is for…” The reason for this must be obvious. Too many people believe that doctrine is divisive and must thus be set aside. We must instead only emphasise love. The author, therefore, labours to show that sound doctrine is for our good as individuals and as churches. “Doctrine isn’t just for a statement of faith that’s hidden away on the back page of a church website; it’s for sermons, small groups, personal conversations, prayers, songs, and more,” Bobby asserts. Once upon a time, topical preaching was killing the churches. Today, it is motivational speaking passing under the guise of preaching that’s doing it. We need to get back to expositional preaching. David defines this as “empowered preaching that rightfully submits the shape and emphasis of the sermon to the shape and emphasis of a biblical text.” This book is all about how to do that. So, this book is more like a workshop manual (with diagrams), which you use while your hands are on the tools of the trade. Is that not what we preachers need? Jonathan begins by showing us how we often approach church membership wrongly (as a club instead of an embassy) and then he delves into Scripture to show us the right approach. He then defines what the local church is and what church membership should be. With that out of the way, Jonathan delves into the practical subject of responsibilities of church membership. This book ends with what to do when members stop fulfilling their biblical roles. As you can see, this is the kind of book you want to put into the hands of all church members. If you are a church leader, this is the kind of book you wish you had read long ago! Jonathan gives us a biblical framework for church discipline so that we understand its basic principles. He then applies those principles to different case studies to help us see how they work. Finally, he takes us to the starting line and shouts, “Ready…steady…go!” In other words, this is a subject to be engaged in and not simply learnt about. I have no doubt that our churches would bear better fruit today if only we understood and applied the teaching in this book!